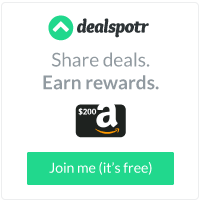 What can you get for the person who has everything for Christmas? 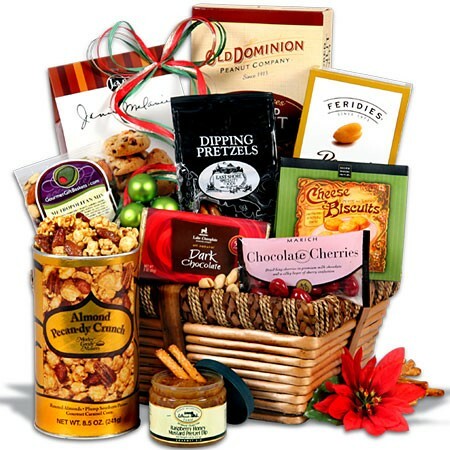 I think the Christmas Gift Basket from Gourmetgiftbaskets.com is the perfect idea! I received the Christmas Gift Basket for review. One of our most popular Christmas designs, the Christmas Gift Basket Classic is an excellent choice for the home or office. Why? Each Christmas Basket contains a variety of award-winning gourmet snacks that appeal to a wide variety of tastes. With gourmet snacks including a chocolate covered cherries, dark chocolate bar, chocolate chip cookies, almond clustered popcorn, raspberry honey mustard pretzel dip along with pretzels and so much more! So, if you want to send a gift that everyone will love, send one of these delicious Christmas Gift Baskets! So, you want to know what's inside? · Almond Pecan-dy Crunch by Morley Candy Makers - 9.25 oz. - This ultra-luxurious candy crunch is made by covering gourmet popcorn and pecans in a rich, smooth caramel glaze. · Chocolate Chip Pecan Cookies by J&M Foods - 6 oz. - Made with only the finest of natural ingredients, these cookies will satisfy even the most discerning chocoholic. · Dipping Pretzels by East Shore Specialty Foods - 6 oz. - These extraordinary pretzels are the perfect unsalted snack! · Robert Rothschild Farm Raspberry Honey Mustard Pretzel Dip - 7.8 oz. - This gourmet raspberry honey mustard dip adds a flavorful zing to pretzels, and goes especially well with the East Shore Specialty Foods Dipping Pretzels that we have included in our Gift Baskets for Christmas. · Salted Peanuts in Box by Feridie's - 7 oz. – Only the finest peanuts, flavored with salt, these gourmet snacks are just as Mother Nature intended. · Signature Dark Chocolate Bar by Lake Champlain - 3 oz. - This decadent and complex dark chocolate bar will satisfy the cravings of even the most discerning chocolate lover. · Buttered Peanut Crunch by Old Dominion Peanut Company - 10 oz. - This flavorful peanut crunch is made with only top of the line gourmet peanuts, brown sugar, and “AA” grade butter. Taste them and you will understand that the best ingredients create the best peanut crunch! · Metropolitan Trail Mix by GourmetGiftBaskets.com - 4 oz. - Our proprietary blend of nuts and dried fruit is a delicious and surprisingly healthy snack. · Parmesan Artichoke & Garlic Cheese Biscuits by Salem Baking Company - 1.5 oz. - These crumbly biscuits will melt in your mouth leaving a trail of flavor to be savored. · Chocolate Covered Cherries by Marich - 2.3 oz. - These indulgent gourmet chocolate covered cherries are one of the favorite snacks in our line of Holiday Gift Baskets. My family loved all of the items in the Christmas Gift Basket! My favorite item was the Buttered Peanut Crunch. It is absolutely delicious! Cooper loved the Chocolate Chip Pecan Cookies, and my husband's favorite was the Metropolitan Trail Mix. There was not anything in the basket that we did not love! I would highly recommend Gourmetgiftbaskets.com to anyone. They have a gift basket for every occasion! My favorite thing about Gourmetgiftbaskets.com is that they offer a Military Donation option, which allows you to purchase a gift basket to be donated to soldier for Christmas. My brother is a marine, and when he was overseas, he looked forward to and greatly appreciated every care package that he received. How great would it be to make a soldier's Christmas by receiving this awesome gift basket? It is definitely something I plan to do, and I hope that you will as well.